Sunrise from our space station. I’m still shaking the sand from my hair as I get the first brew of cowboy coffee going. It occurs to me that I can’t remember the last time I showered, and as I watch a tiny gecko scamper into a seemingly nonexistent crack in the boulder acting as my kitchen counter, I am momentarily glad to have something in common with it: I, too, am camouflaged, my face and hands caked in the same red sand that makes up the landscape we share. That’s about all we have in common, the gecko and I. Unlike me, he belongs in the desert, whereas I am struck by how utterly I am an outsider here. Bix, similarly coated in dirt but visibly more comfortable, emerges from the tent. He makes his way to the kitchen, here and there kicking a cloud of dust under a sagebrush in case it’s the residence of someone venomous. I hear a distinctive rattle and am at once concerned to be in the presence of a snake and annoyed with myself for not having done the same. It is our third day in what Bix refers to almost exclusively as “Kokopelli Country,” but which most would call the Colorado Plateau. 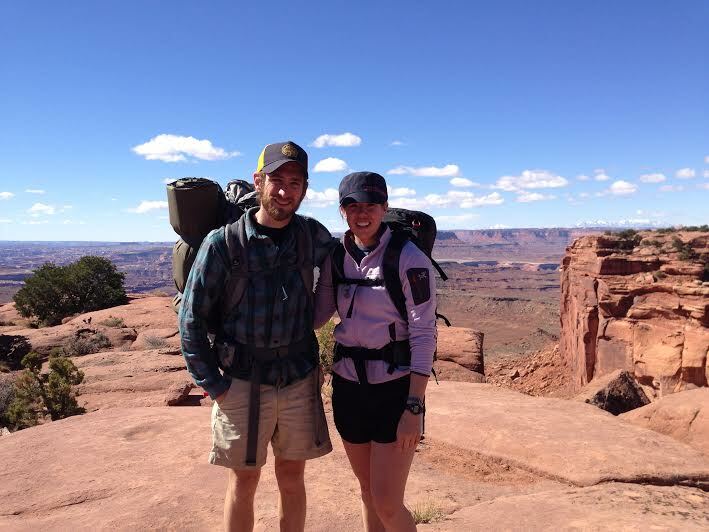 We’re in Canyonlands National Park, a mere thirty miles outside Moab proper, though you wouldn’t know it by the view. To the west and three thousand feet below winds the Green River; south of us lie the still-snowy Henry Mountains; north and east present an impenetrable fortress of towering red cliffs and their watchtowers. We still haven’t seen another person. The sun peeks playfully over the seemingly impassable cliff behind us. We sip our gritty coffee as it decides whether to extend its soft pink light from the canyons in the distance to the sand at our feet, and it isn’t long before it’s made up its mind: today will be another hot one. The appearance of the sun prompts a robust chorus of chirping from the few birds rugged enough to make the desert their home, and the landscape comes to life: our cold-blooded neighbors begin commuting from their hidey-holes to the warm sandstone where they’ll spend their days; the Mormon tea and locoweed, green this morning, begin the day-long process of losing their vibrant color; the Russian tumbleweed, that invasive species so ironically representative of the American West, embarks upon its iconic, bouncing crash-course across the plains; Brother Raven, his iridescent feathers contrasting starkly with the now-brilliant blue sky, soars overhead, scanning the canyon country for the carcass of a critter less fortunate than he. As each of these creatures embarks upon his daily routine, I am more grateful than ever to have a break from mine. This is a much-needed reprieve from the bustling metropolis of Los Anchorage. Despite that we’re calling it “vacation,” survival in the desert is a great deal of work. For example, we’ve carried in all the water we’ll need for the trip. There isn’t any visible water off Murphy Loop, at least nothing potable. From our vantage point on the Murphy Hogback—the mesa from which we’ve descended—the alkali flats, a thousand feet below, appear to be the shiny remnants of yesterday’s afternoon thunderstorm. Up close they’re a thick crust of powdery white, drawn to the surface by the recent flash flood, then stuck in the Murphy Wash atop a soupy mixture of red mud, fist-sized stones, and the fresh tracks of the canine (and, to my great dismay, feline) natives. It’s chaos now, but after the next flood—which, I hope dearly, will occur well after we’ve climbed out of the wash—the slate will be wiped clean again, for it is the media upon which the desert will tell the next chapter of its story. The Murphy Wash is by far the biggest, but by no means is it the only wash in the Island in the Sky District. Sandy passageways for blood-colored mud are intricately woven across the rugged plateau, wrinkles on the weathered face of a desert rat who’s spent too much time in the sun. The washes, big and small, are ready: the clouds roll in, the channels are flooded, a wall of water descends into Murphy Wash—the sun reappears, baking the surface of the mesa and drying out the deluge as quickly as it came. The desert is a place of extremes. We finish our coffee and go about breaking camp. I approach the tent cautiously, hoping not to encounter the owner of the rattle Bix set off before breakfast. The tent is flanked to the east and west by boulders its own size and then some; I’m convinced we’ve set up camp in a snakepit. It’s okay to be a little afraid of snakes, I tell myself. Smart, even. For God’s sake, Indiana Jones was terrified of snakes! Humming the familiar theme song, I toss a few pebbles into the gap beneath the portliest of the three boulders. Reminding myself of Bix’s insistence that a rattler bite “won’t kill me”—and steeling myself to the possibility that I will test this wisdom—I gingerly begin taking down the tent, dispersing the rocks we’ve piled on top of each stake and shaking the fly free of its dusty red coat. I’m glad when the tent is packed. It means I’m free to leave the shadows of the snakepit, but, more importantly, it signifies a great victory: the tent has survived its second windstorm in as many nights. Sixty-mile-an-hour wind gusts had punctuated a steady breeze the previous afternoon as we searched for a campsite, amplifying the already challenging task of finding a suitable campsite. It’s not ideal, but it’s home tonight. Our backcountry permit allowed for “dispersed camping” anywhere along Murphy Loop, which includes the Hogback and Wash of the same name. Permitted backpackers are to set up camp out of sight of the trail—tricky to do with such sparse vegetation—and off the delicate cryptobiotic soil, whose survival is key to the success of the inhabitants of the desert. This leaves two options: in the Wash, where we are sheltered from wind but susceptible to flash floods, or on a rock outcrop above the wash—safe from floods but taking the brunt of the aforementioned wind. Like Ed Abbey, Bix is plagued by nightmares of flash flooding as it is, and the wind seemed a reasonable alternative. We set up the tent and pile rocks atop the stakes, and as Bix jogged around the corner to investigate whether a leeward side of the outcrop existed, a forceful gust wrestled the tent—to make matters worse, borrowed from a friend in Colorado—from my hand and sent it soaring across the mesa in a cloud of crimson dust. Sage and juniper bushes clawed at our bare legs as we sprinted across the desert, reaching for our shelter but grasping only handfuls of scarlet dirt. The dust filled in our scrapes and cuts before the blood could seep out, and by the time we had reclaimed the tent, our legs mirrored the unforgiving landscape. Afraid to release it from our clutches, we collapsed onto the tent, exhausted and relieved and, for my part, wondering where we could possibly set up camp more permanently. I opened my mouth, caked in dirt and bits of juniper, to voice my concern, but let out a chuckle instead. We must have looked ridiculous, sprinting across the desert after our tent, then sprawled across it and laughing hysterically. When we regained out composure, the desert was silent again. Soberly, we herded the still-intact tent in the general direction of its original site, our lonely packs now the only indication of our presence in the uniformly desolate landscape. Another gust of wind threatened to send us galloping after the tent again, and that’s when the snakepit started to look good. 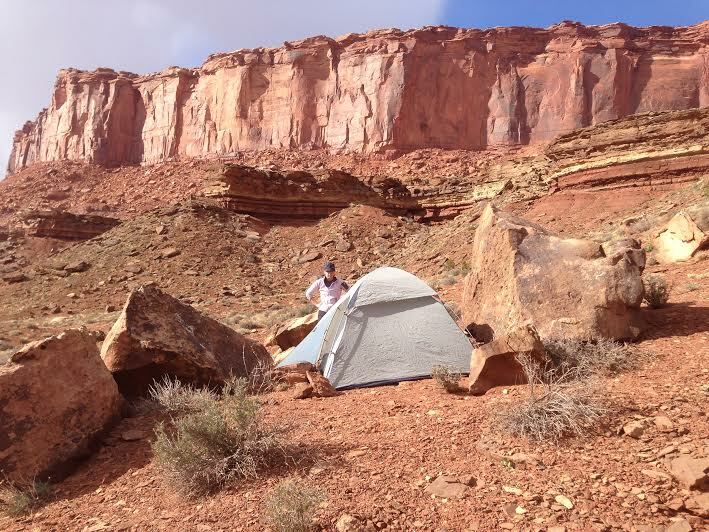 It wasn’t ideal, but neither did we relish the idea of stowing the tent safely in a pack and bivying in a dust storm—or, worse yet, hiking out of the canyon and back to the car. In a thunderstorm. In the dark. The snakepit proved reasonably well protected from wind, and it was cold enough that any snakes, if bothered by our presence, lacked the energy to do anything about it. Dinner, whiskey, one last pee. We collapsed into our sleeping bags. 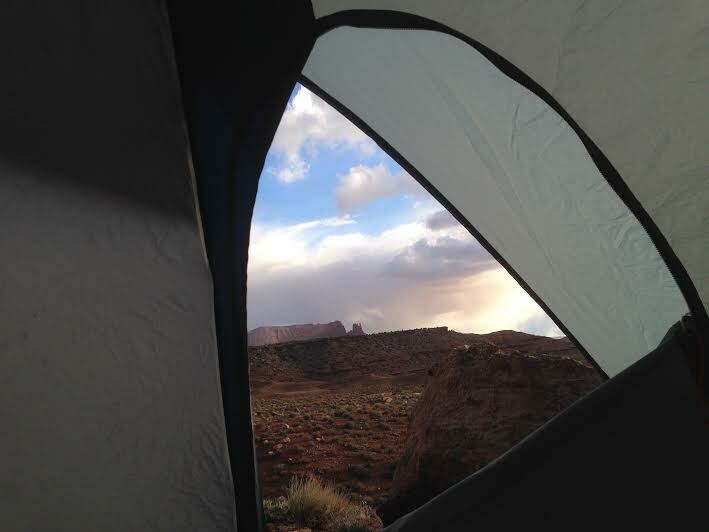 Outside, the wind roared, and our little tent quaked with each gust. Bix snored peacefully as I contorted in my sleeping bag, debating whether I was more worried about the wind itself or the sounds it masked. There’s something powerful about the desert; something ancient and inexplicable in its infinite ocean of sand and soil and eerie stillness. With only my sleeping bag and the shuddering nylon tent between me and the darkness, I mull over a legend I heard once: a story about a man in black robes, with long fingernails and a great dark beard. The embodiment of evil, apparently. He inhabited the deepest parts of the canyon country, in dark corners so remote even the Anasazi people, those who belonged in the desert, stayed away. We’re only a few miles from a trailhead, I tell myself. He doesn’t come here. Still, whenever the wind stopped and the silence set in, I found myself holding my breath. I was sure I heard footsteps, scratching, waiting. I was sure we were being watched. I slept fitfully, desperate for dawn. Despite my relief when it finally came, I chastised myself for having let my imagination get the better of me. Tonight, I promised myself, I’d sleep peacefully. By the time we shoulder our packs and scramble back into the wash, the sun has fully embarked on its westward journey. The rocky walls of Murphy Wash do little to protect our already sunburned faces, but I don’t mind—the rays feel soft and warm on my Vitamin D-starved skin. Standing atop an Island in the Sky. In little over a week, I’ll be back in the land of ice and snow, albeit now with more sunlight. There will be decisions to be made: Where will we go in the fall? Will we spend another season up north, or start a new life somewhere else? The desert has presented us with sufficient challenges to forget these questions for the time being. For now, we have only to decide where to camp next. I’m getting used to making my home in these inhospitable climates. A little creative routefinding deposits us at a weather-beaten sign indicating the distances to White Rim Road via Murphy Wash and the Hogback, respectively. An equally worn trail wanders into the canyon, switchbacking up what appears to be an impossibly steep drainage. Full of bacon and coffee, eager to take in another spectacular view, we begin the 1,400-vertical-foot journey upward. I do believe this is my favorite post of yours, yet! Your beautiful imagery brings me back to the Utah desert. Love it and LOVE Abbey’s Desert Solitaire–one of my favorite quotes.